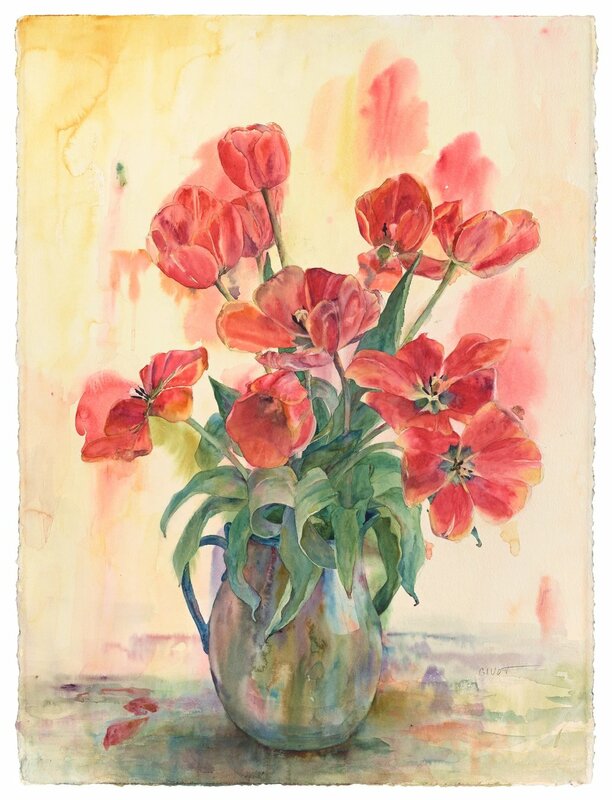 Winnie Givot is a skilled watercolor artist and teacher. Her art reflects her love of beauty and her understanding of its importance in our lives. She is interested in portraying both the natural beauty which, though everywhere, is often unseen, and also the deeper beauty of the subject. And she is aware of mystery - that there is more to life than meets our ordinary eyes, and she also strives to paint that, to express the ephemeral, the numinous. Her sensitive renderings touch the heart of the viewer. Sometimes people say, "Watercolor is the hardest medium" as if to say "why would you do that?" But Winnie sees that painting in watercolor is like a dance. When watercolor touches wet paper mingling with other moist colors, there can be delightful results, which can come in no other way. She revels in this dance, watching the transparent colors flow and play, experimenting to see which brush strokes or proportions of water and pigment will give her the results she wants. More than 800 of her paintings are in collections internationally, a few of which are those of Pres. & Mrs. Barack Obama, Pres. & Mrs. George W. Bush, Colin Powell, Deepak Chopra, Senator Ron Wyden, United Parcel Service, Colorado College, Harley Brown, Gov. & Mrs. John Kitzhaber and The Congress of Chile. Her paintings have been included in numerous solo shows and national and international juried exhibitions. Winnie Givot is not only an exceptional artist, she is also an exceptional teacher. She teaches Friday classes during the school year along with three-day workshops in the summer and 10-14 day painting retreats abroad. She lives near Sisters, Oregon in a straw bale house on a small ridge overlooking the Three Sisters and the Cascade Mountains. Her barn studio is welcoming to students and collectors and those who simply want to share the beauty and peace there. • Turn left on Holmes Rd. • Turn Lefton Wanona Rd. for .4 miles and take the fork on the right. • My studio is at the end of the driveway..